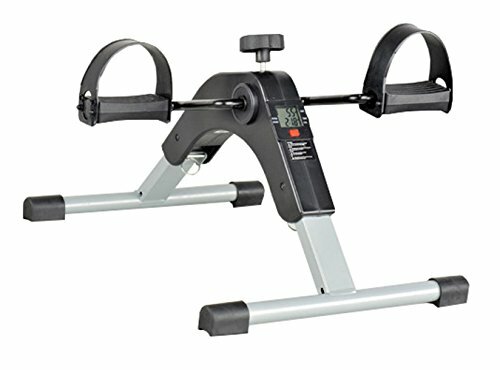 This portable folding pedal exerciser with electronic display is perfect for leg and arm exercises, physical therapy and burning calories in the comfort of your own home or in the office.It can be placed on the floor or on a table.It is great for those who want to maintain a healthy lifestyle in a convenient way. A 5-function LCD readout displays your exercise time, revolution count, the speed in rounds per minute and calories burned so you can keep track of your progress. It also has a scan feature that alternately displays the measurements automatically, providing an accurate readout of what you've accomplished. Resistance can be adjusted with a big tension screw, allowing you to increase or decrease the strength of your therapy to meet your different needs. Made using chrome frame to supply stability on exerciser surface,which is more safe and durable, and lower legs with non-slip rubber frame caps can protect the floor or table, this also prevents the device from sliding. Fortable folding design for easy transport and storage. The device comes fully assembled and includes 1 battery so you can use it right out of the box.Simply sit down, place by your feet, and push your legs or arms forward in a rotating motion. If you have any questions about this product by Healthcare, contact us by completing and submitting the form below. If you are looking for a specif part number, please include it with your message.